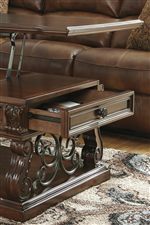 Reflect an elegant style in your living room decor while adding versatile storage and function with this cocktail table. It features a lift top that makes it easy to use with a laptop or when serving snacks. 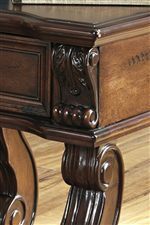 Casters at the base of the table allow it to move easily, especially handy with a reclining sofa or sectional. Two drawers, one at each end of the table provide extra hidden storage. 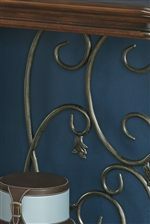 The large shelf at the base of the table can be used for decorative pieces and other items. The traditional style of the table includes scrolled posts, a shaped table top with banded veneer, and metal accents to make a grand impression. The Alymere Traditional Lift Top Cocktail Table with 2 Drawers & 1 Shelf by Signature Design by Ashley at Beck's Furniture in the Sacramento, Rancho Cordova, Roseville, California area. Product availability may vary. Contact us for the most current availability on this product.